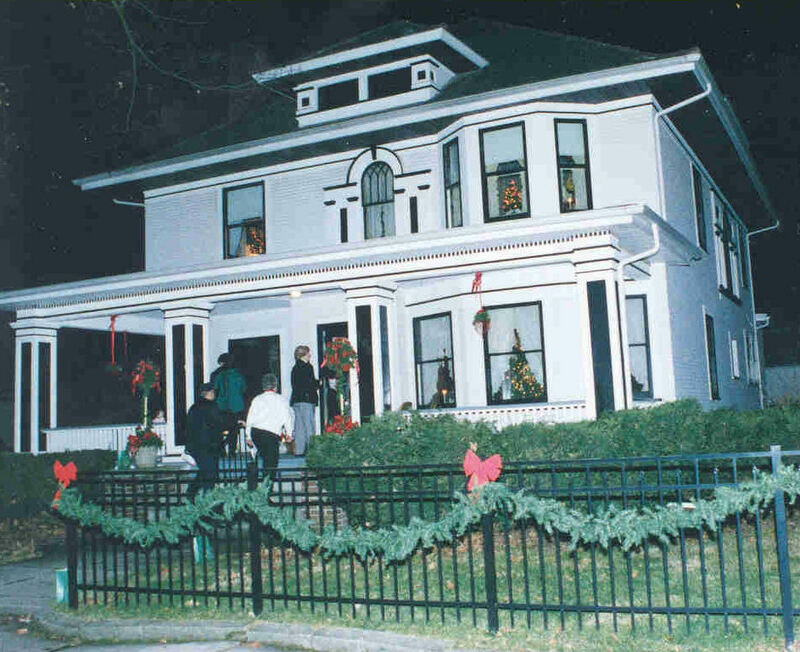 People Engaged in Preservation, La Porte, Indiana's local historic preservation organization, has organized an annual Candle-Light Tour of Historic Homes since 1996. French explorers first saw the area of northern Indiana where the city of La Porte (population 22,000) now stands in 1670. The Indian trail which had led them through the state's dense forests opened like a door, or la porte, to the prairie lands beyond. The city of La Porte was officially platted in 1833, but there was considerable prior settlement in the area, and La Porte was actually named the official seat of La Porte County in 1832. The town's growth and prosperity were insured by the construction of the Michigan Road through the county, as well as two major rail lines in the 1850s. The town grew quickly, and in 1852 was incorporated as a city. German immigrant Meinrad Rumely and his brother John established a foundry in 1853, which grew into the huge Advance-Rumely Company, known in particular for the "Rumely Oil-Pull Tractor Engine." This tractor was critical in the transformation of the Midwest into a global breadbasket. The company was purchased by tractor giant Allis-Chalmers (A-C) in 1931, and the "La Porte Plant" continued to produce until A-C shut its doors in 1985. Much of La Porte escaped the wrecker's ball that ravaged many cities in the 1960s and ‘70s, and a large section of the downtown became a National Register Historic District in 1983. In 2007, the city created a Downtown Development Zoning District, overlaying and enlarging the National Register District, to emphasize the importance of the architectural and historic assets of the downtown and the key role they would play in long-term sustained economic development. The Zoning District provides exterior design standards to apply to any structure in the district and requires approval for any major renovation and rehabilitation plans. In 1994, People Engaged in Preservation (PEP), a local historic preservation organization, was established. Their mission is "to promote awareness of the importance of our area's historic architecture." Some of PEP's programs include preservation education, scholarships for preservation studies, a Web-based walking tour of the city's locally designated historic structures, and the annual Candle-Light Tour of Historic Homes. Begun in 1996, this event takes place in December and draws thousands of visitors. The featured sites range from pre-Civil War era to World War II, and each stop includes the history of both the structure and its past owners. The Candle-Light Tour also features live music at each site, hot drinks for tour-goers, and a souvenir booklet with pen-and-ink drawings of each building alongside a detailed history. The tour has welcomed more than 100,000 visitors over the years, and remains extremely popular with both locals and guests.